Windows has some built in methods of taking screenshots, but honestly they’re a lot more trouble than necessary to do something as simple as take a picture of what’s on your screen. So today I’m going to show you how to easily take a perfectly sized screenshot using a free program called Greenshot. Greenshot is very easy to install, just run the installer program, follow the on screen instructions and you’re done. Greenshot doesn’t come with any spyware, adware, or unwanted programs which is really a nice change of pace compared to most of the other “free” software on the internet. Once Greenshot is installed and running is sits in your system tray at the bottom right of your screen. 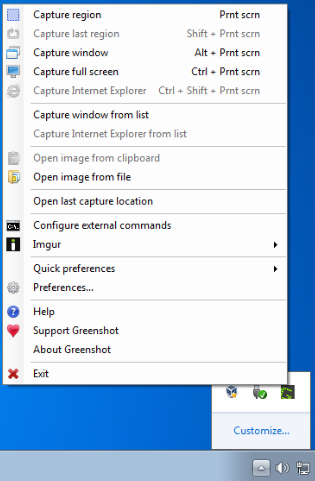 To use Greenshot to take a screenshot, just right click the icon and select one of the 5 capture modes from the top of the list. I normally select either “Capture region” or “Capture window” depending on what type of screen shot I’m taking. 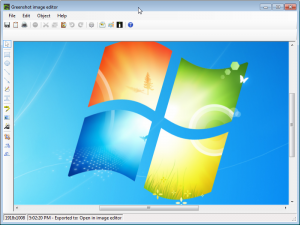 Capture region will let you use your mouse to select exactly the area of the screen you want to take a screen capture of, and Capture window lets you select a window you have open on your computer and capture just the interface of that window. After Greenshot has taken your desired screenshot, it’ll show you another menu with options of what to do with the image you just capture. 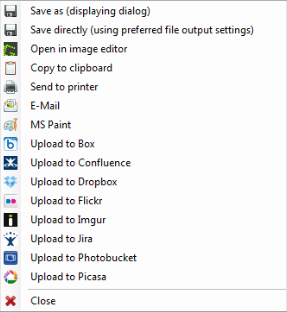 There’s the normal “Save file” options, but Greenshot also has the ability to directly upload image to various image hosting websites, the print your image automatically using your printer, or even to open the image up in Greenshot’s own builtin image editor if you need to make changes or annotations. Because I do a lot of software and websites reviews I end up using Greenshot on a daily basis. It’s made taking good-looking screenshots an quick and easy process and saved me probably hours of time by now that I would have otherwise spent mucking around in an image editor trying to edit the screenshots Windows takes. I’d recommend it to anybody. Got a computer problem you just can’t solve on your own? ZookaWare ITZooka technicians are here for 24/7 remote technical support. I’ll be honest: I HATE Windows 8! Well, hate is a strong word. I’m fond of the parts it shares in common with Windows 7. I like the updated task manager, and with Windows Defender being included by default I’m glad to see Microsoft is making strides to make Windows as secure as it can be out of the box. Actually, it’s not that bad. I’m sure it’s great on tablets. But, like more than 90% of Windows users, I’m not using a tablet. I’m using a grown-up computer with a keyboard and mouse. To do, you know, WORK. This brings me to my biggest problem with Windows 8: They killed the Start Menu. I didn’t realize until Windows 8 just how important the Start Menu was to performing useful operations on a PC. It was the one place you could click to start just about any action on the computer. Whatever you wanted to do, the first step was usually to click on the Start Menu. And now it’s gone. Fortunately, I’m not alone in my appreciation of the magical, wonderful, dependable Start Menu. The folks at IObit have managed to recreate our previously shunned friend in the form of “Start Menu 8”, their Start Menu replacement for Windows 8. In a number of ways it’s actually better than the Start Menu that was in previous versions of Windows. It keeps the look, feel, and usefulness of the Windows 7 Start Menu, but is completely customizable, so you can tune it to exactly your desired level of functionality. Using Start Menu 8 has made being productive on Windows 8 much easier for me, despite Microsoft’s best efforts to the contrary. If you’re like me, and want to be able to use your PC to do useful things instead of spending your day staring at a cubist interpretation of a bag of skittles, give Start Menu 8 a try. It’s free. 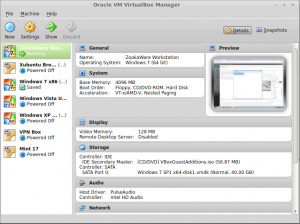 It is bundled with some other “system cleaning” software, be sure to uncheck the box if you do not wish to install the bundled software.